The params input argument for these methods is a struct that has as properties all unique fields of the model. This means, for all three methods, the id field is accepted (as the corresponding models each have an id field annotated as @unique). The params struct for the user method additionaly has an email field. Basic filters let you specify certain criteria to constrain which records should be returned in a list. 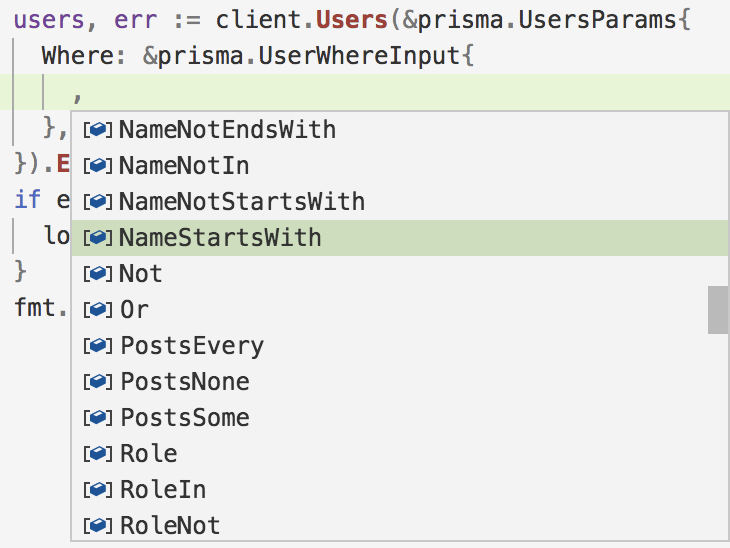 The filters are specified in the Where struct of the params argument which is accepted by any list query. The type of the Where struct depends on the model for which it was generated. Relational filters can be used to constrain the returned records on a relation list field. The types used for filtering are similar to basic filters, the major difference is that the filters are not applied on the root level of the method call but when querying a relation (via the fluent API) on a later level. When querying a list of records, you can order (sort) the list by any scalar field of that model. Each generated method to query a list of records therefore accepts the OrderBy field on the params input struct.